Winmate Rack Mount Panel PC series with Intel 3rd Generation i5/i7 processors (Ivy Bridge) was designed for diverse applications that require a rugged all-in-one design to withstand the harsh industrial environment. This Intel Core i5/i7 Processor provides high performance needed for increased computing and graphics, this platform is perfectly suitable for industrial automation. With the additional of handle bar, it provides extra convenience for quick installation and removal of the display. Like other Panel PCs, these Winmate Rack Mount Panel PC products are available with various display sizes. Depending on the application, users can select from 15-inch, 17-inch, or 19-inch Panel PC. 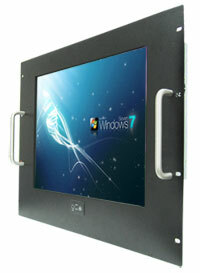 These Panel PC products come with 5-wire resistive touch screen. All models are available with 2 x SO-DIMM, DDR3 up to 32GB of RAM, and it’s also support Win XP embedded, Win 7 embedded, or Win 8 embedded. Likewise, all external connectivity is combined in location at the bottom of the unit. Winmate rugged rack mount Panel PC products were constructed with aluminum front bezel and it is very suitable for IT Data centers or Automation control process in harsh industrial environment.